"The visit to the waterfall in the woods stays with me and a domicile has taken vague shape in my mind to the music of the stream. When contours come you will see it. Meantime, to you my affection." Classic photo by Corsini of Fallingwater, Ohiopyle, (Bear Run), PA. In the late 1990s, Fallingwater, nestled in the woodlands surrounding Pittsburgh, came perilously close to collapse. The same lofty dreams that made the house so strikingly beautiful - many American architects considered it the best building ever constructed in the United States - also made it amazingly fragile. Its cantilevered balconies threatened to buckle from lack of support, but that, and myriad other structural problems, have hardly dulled the shine of Frank Lloyd Wright's most famous architectural wonder. Fallingwater, the brainchild of Wright and department store magnate Edgar J. Kaufmann, emerged during the Great Depression as a startling and much-loved reminder of the potential of American genius. Edgar J. Kaufman, Sr. standing in his office in Pittsburgh, PA, circa 1940. By the time of his death in 1959, Frank Lloyd Wright was the most famous architect in the world, in no small part due to the success of Fallingwater. Less well known, however, is that by the time Edgar J. Kaufmann approached him in 1934 about building a house in the mountains of southeastern Pennsylvania, Wright had been in a creative slump since his completion of Tokyo's Imperial Hotel in 1922. By the mid-1930s Wright was nearing seventy, and his modern style of architecture, which depended heavily on harmony with nature, had fallen out of favor with an American public increasingly enraptured with a mechanized vision of the future. Though far from destitute, Wright by 1935 could sympathize with Depression-weary Americans' sense of professional uncertainty and personal doubt. 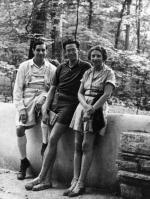 Edgar J. Kaufmann, who commissioned Wright to design Fallingwater, led a much different life. Born into a minor branch of a wealthy family, Kaufmann's early life was comfortable, if not remarkable. After a series of untimely deaths left him with the presidency of his family's Pittsburgh department store chain, Kaufmann recognized the promotional value of architecture, and recruited the best and brightest architects to work on his commercial properties. 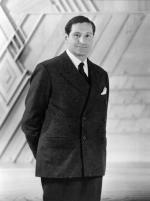 By 1933, however, Kaufmann was dealing with a Depression-induced drop in revenue and an ongoing lawsuit with a rival department store. Ready for a new project that would take his mind off of problems beyond his control, he chose to build a new house in the middle of the Kaufmann family campground at Bear Run, not far from Pittsburgh. How Kaufmann chose Wright for the job remains a mystery. Kaufmann's son, Edgar Kaufmann, Jr., argued until his death in 1989 that Wright first met his father through his own apprenticeship at Wright's Taliesin West. What is evident is that Fallingwater served purposes for both men beyond pure business -Wright used the building as his revenge against an architectural community that had disregarded him, and Kaufmann against a social class that had shunned him for being Jewish. The Kaufman family, circa 1940. When construction on Fallingwater - which was Wright's name for the building, the Kaufmanns never used it - began in 1936, Wright had already been working on the designs for nine months. The early absence of a structural engineer led to several later design flaws, but few doubted the genius of Wright's vision, and even warnings that the rock strata might not be stable enough to support such a large structure did not deter the architect. Constant changes in the projection of the balconies wreaked havoc with engineers' attempts to calculate the amount of reinforcement needed, resulting in the use of too much heavy steel. This would later cause the balconies to sag slightly and put pressure on the lower floors, earning Fallingwater the dubious sobriquet, "America's Leaning Tower of Pisa." The problem has since been remedied by the introduction of a steel cage to cradle the main floor and keep it safe from the collapse of the cantilever above. Although Kaufmann and Wright were well removed from the Depression that had ravaged much of the country, Fallingwater's $150,000 price tag, equivalent to about $4 million today, was hardly frugal. Kauffman, at least, was publicity-conscious enough not to flaunt his wealth. When Wright recommended gilding the building's several balconies, Kaufmann chose instead to simply paint them. After construction was completed in 1937, a publicity blitz carried the Kaufmann's private home into the national limelight. Americans immediately fell in love with Fallingwater. Despite its status as a luxury house with all the latest modern amenities, Fallingwater's overall effect was modest. In its dependence on the use of concrete, Fallingwater reflected the rustic simplicity of Roosevelt's New Deal housing projects, while its seamless integration with its natural surroundings stressed the importance of resource conservation. During the 1930s, many people became disillusioned with cities, which they perceived as the corrupt commercial and industrial centers that had bankrupted the nation and left millions impoverished. Feeling revulsion towards the polluted and overcrowded man-made environment, they turned towards nature for solace and inspiration. Fallingwater's cantilevered balconies and layered stone walls echoed the natural outcroppings of the terrain, while the centerpiece of the house itself was the small, swiftly-moving Bear Run stream. Despite its touches of European and especially Asian influence, Fallingwater came to be regarded as quintessentially American, both in the States and throughout the world. After Fallingwater, Wright and Kaufmann never created another building together. The house in the woods had changed them both; it revived Wright's career, and helped turn Kaufmann into a well-known patron of the arts. After his mother's death in 1952, and his father's in 1955, Edgar Kaufmann, Jr. inherited Fallingwater, and took meticulous care of the property until 1963, when he turned it over to the Western Pennsylvania Conservancy. The architect Paul Rudolph once called Fallingwater "a realized dream...[that] touches something deep within us about which, finally, none of us can speak." An architectural fantasy in stone and steel, constructed in the depths of the nation's worst economic crisis, Fallingwater still draws 140,000 visitors every year, making it the most popular house museum in the country. Jr. Kaufmann, Fallingwater: A Frank Lloyd Wright Country House. Introduction by Mark Girouard (New York: Abbeville Press Publishers), 1986. Franklin Toker, Fallingwater Rising: Frank Lloyd Wright, E. J. Kaufmann, and America's Most Extraordinary House (New York: Alfred A. Knopf), 2003. Lynda S. Waggoner, Fallingwater: Frank Lloyd Wright's Romance with Nature (New York: Fallingwater, Western Pennsylvania Conservancy, in association with Universe Publishing), 1996.